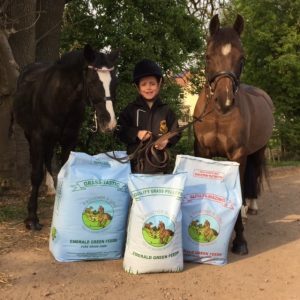 I'm so excited to be writing this blog and I feel so lucky to be a Brand Ambassador for Emerald Green Feeds. Magic and Louis also like it, they've been having the grass pellets in a treat ball too!! I've been really busy with pony club and enjoy taking Louis to all the rallies. He's 24 and feels full of life and doesn't look or act his age. Both my brother Billy and I have been doing quite a lot of games on him and I'm so pleased to have won the under 12's every time out. We have taken Magic to lots of show jumping comps this month and she has been jumping amazing, but we do have a few communication problems, so mummy says we need to work on these before we go out next. Magic is quite big for me so we need to school her and train her to wait and listen to me. Earlier this month , I was really lucky to go for a weekend away with Magic to Field Farm. We slept in the the horsebox and had days cantering down the beach and in the sea, and playing on the cross country course. I loved it and Magic behaved just perfectly. I also watched Badminton on the TV and felt inspired by fellow EGF Brand Ambassador Ros Canter - I'd love to ride like her.